It has been a week since a tsunami hit the Sunda Straits. The dead toll reached 500 with more than 20,000 people displaced and sought shelters. The risk of another tsunami is greater given the current activity around Anak Krakatoa volcano that triggered the tsunami on December 22. “The likelihood of further tsunamis in the Sunda Strait will remain high while Anak Krakatoa volcano is going through its current active phase because that might trigger further submarine landslides,” a disaster expert said. Since December 23, A-PAD Indonesia and its member ACT (Aksi Cepat Tanggap) have sent teams of search and rescue (SAR), medical, and logistics to search for survivors and to provide medical assistance to the Tanjung Lesung area. 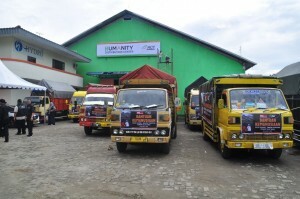 From December 28, they also dispatched 20 emergency vehicles to Kalianda and Rajabasa to deliver relief goods such as food items, water and clothing to the tsunami affected in South Lampung Regency. 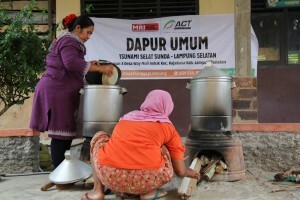 In Kalianda, ACT has been providing more than 700 hot meals to the survivors at three different shelters. “Combining medical and relief services, our team continue to provide hot meals to the people at shelters by setting up outdoor public kitchens. We bring the equipment and food items from Java and Sumatra,” said Mr. Lukman Aziz, General Manager at the Communication Department. 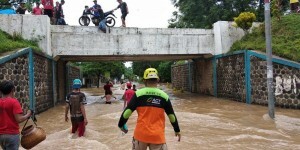 ACT began to implement programs to build contemporary shelters and to provide fishing boats to the affected people, while operating “ACT Humanity Store” Warung Wakaf to distribute food items and to provide cash-assistant to the survivors. Indonesia hit by earthquake on Lombok in July, double earthquake-and-tsunami on Sulawesi in September. 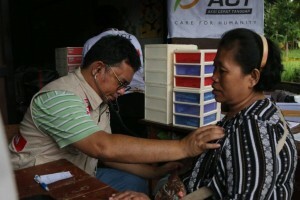 A-PAD supports A-PAD Indonesia and ACT to conduct disaster relief activities in both areas and will assist their emergency response programs for the tsunami survivors. At the moment, the tsunami affected people are in need of medicines, prepared food, clean water, blankets, mattresses, tents or tarpaulins, hygiene kits, electrical generators, rescue equipment and cadaver bags. We will continue to report on the situation from Lampung. Thank you very much for your support.